This Disney Springs T-REX Restaurant lunch review is based on my experience when visiting the restaurant in November 2017 with my family. When you travel to Disney Springs with young children, you will mostly likely end up at the T-REX restaurant for either lunch or dinner. It’s hard to miss the life-sized dinosaur out front and as soon as they see it, bam! You know where your next meal is going to be coming from. My family and I planned a trip to Walt Disney World during the week of Thanksgiving 2017. While I might not recommend visiting during that week due to the insane amount of people who visit during that time, I would recommend every single restaurant we were fortunate to eat at! We purchased the Deluxe Dining Plan while booking our trip through the Disney website. This plan includes an entree and beverage for breakfast, and an appetizer, entree, and dessert for lunch and dinner. In addition, each person also receives 2 snacks per day. Disney is changing the plan slightly for 2018, but it seems that it will just include even more options! The Deluxe Dining Plan treats anyone 10 and up as an adult, so my 10-year-old son ordered off the regular menu for all of our meals. Anyone under 3 is free so long as they just share food from other peoples plates. Sometimes my 2-year-old just ate from our plates, and sometimes we ordered additional food for him at an additional cost. We did not have reservations for this meal, and had only a 5-10 minute wait to be seated. On our most recent vacation to Disney World, we took a super early flight and arrived in Florida around 9:00am. Our plan was to spend the first part of the day, including lunch, in Disney Springs. As soon as my 10-year-old, Jaxon, saw that there was a dinosaur-themed restaurant, we pretty much knew he wouldn’t be happy going anywhere else. As soon as you walk in you will see an amazing display of decor with animated dinosaurs throughout. 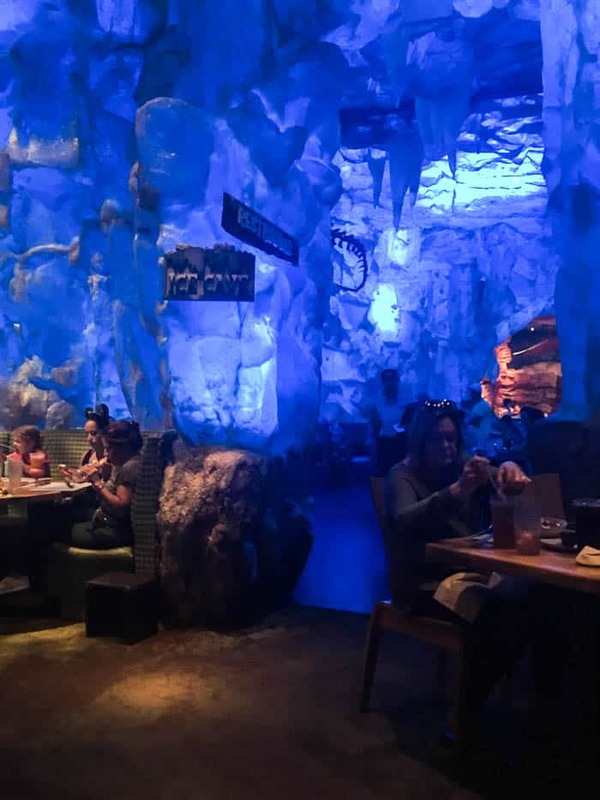 There is even an ice cave that changes colors as you dine. About every 15 minutes or so, it gets really dark and sounds as if you’re in the middle of a storm. My kids loved it. I do feel that this restaurant is more about the experience than the food. We did not use our Disney Dining Plan for this meal and therefore, did not order nearly as much. I apologize for the lack of quality in the photos. The lighting is very dim and we did not want to disturb other diners by using the flash on the camera. My fiance, Daryl, wanted to order the Dual Dip as an appetizer. I am never too keen on seafood-based dips, but I’m all for cheese dips! 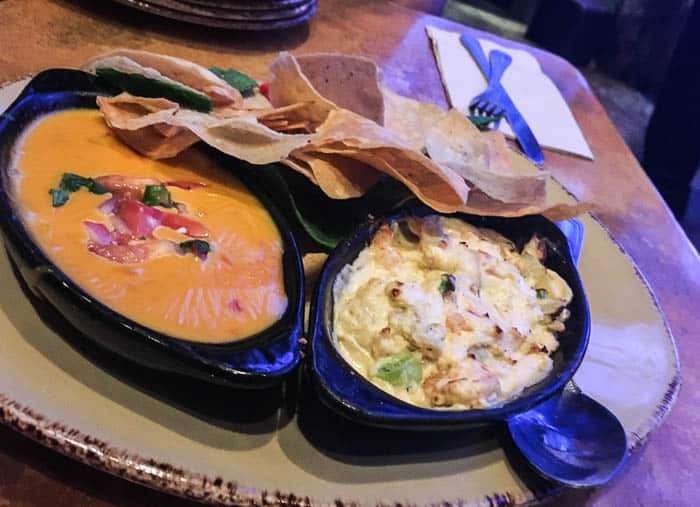 This comes with Shrimp and Artichoke Dip as well as Chili Con Queso Dip so we were both happy. The Meteor Meatloaf was on a special menu, however, if it’s available when you visit, I highly recommend it! 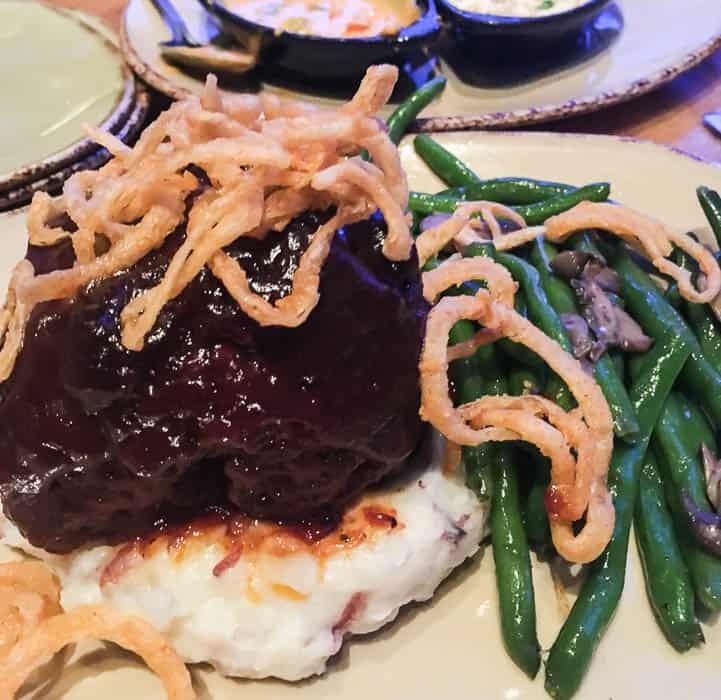 It’s a huge serving of meatloaf covered in a sweet barbecue sauce and topped with crispy onions. It’s served with mashed potatoes and seasonal vegetables. This meal was huge! I couldn’t finish it all, but I also couldn’t stop taking “just one more bite!” This is most definitely the reason desserts were not ordered! Daryl also ordered off of the specials menu. I’m not quite sure what the actual name of his meal was, but it included smaller portions of three different entrees. 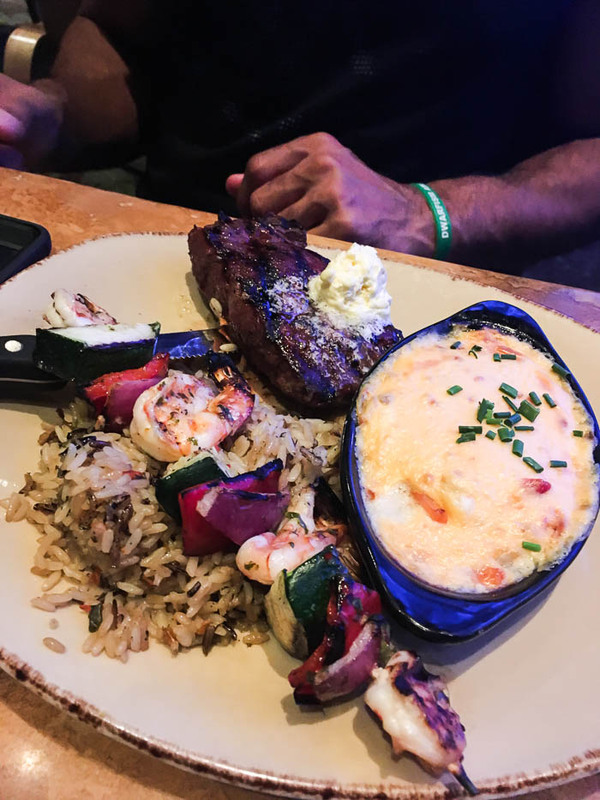 He had a steak, a shrimp skewer, and a shrimp scampi. It came served with rice. While I really loved my meal, Daryl felt his was on-par to what you would get at Applebee’s or somewhere similar. We had Jaxon order off the adult menu, since the kid’s meals are typically not enough for him anymore. He ordered the Bronto Burger, but asked for no toppings except for cheese and added bacon. 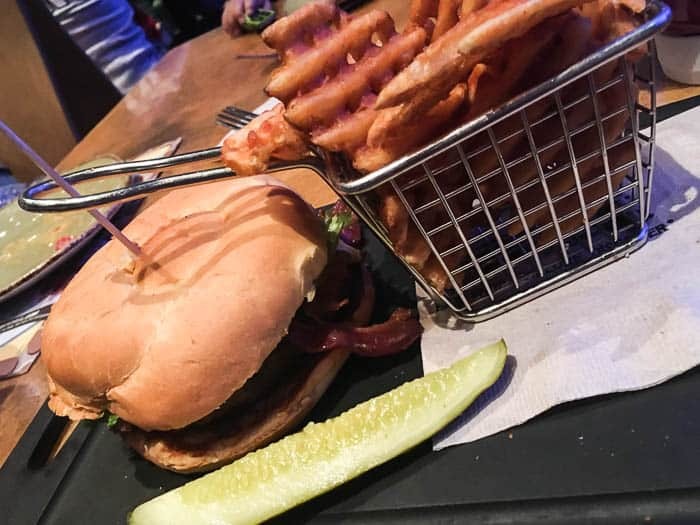 His burger came with a side of waffle fries and a pickle. He also really enjoyed his meal and didn’t even want dessert! Not right away, at least. Overall our experience at the T-REX Restaurant was fun! I’m sure our boys will definitely want to go back the next time we take a Disney vacation. 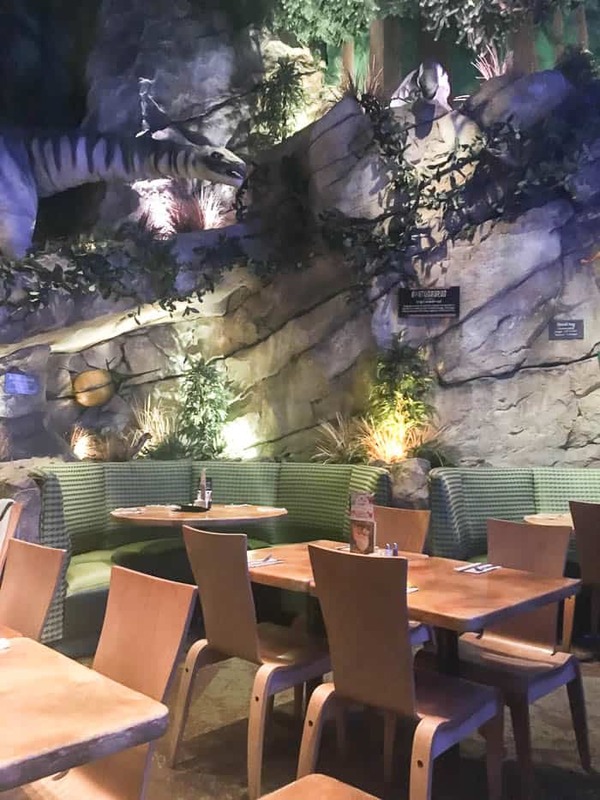 Because the menus are always changing, I can’t guarantee the same selections will all be available as in this Disney Springs T-REX Restaurant Lunch Review. To see the current menu and prices, click here!